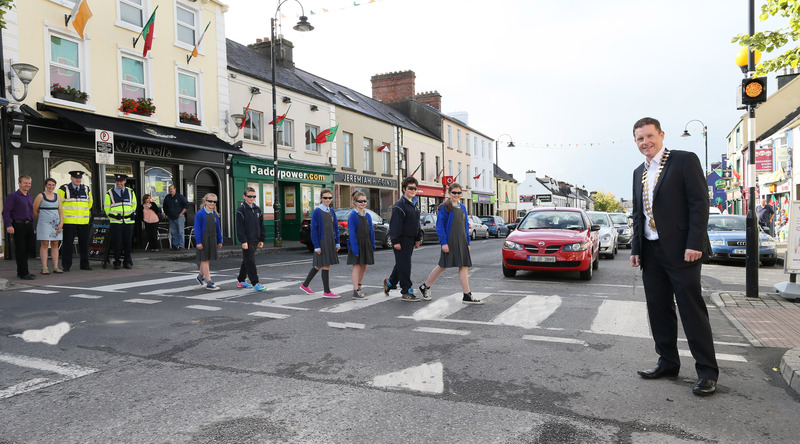 The Beatles brought international fame to the zebra crossing in 1969 with their album cover, now a new crossing launched this week will help to keep school pupils and other pedestrians safe on the busy Claremorris town. 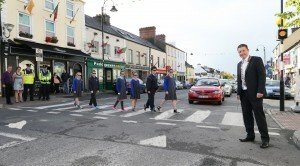 The zebra crossing was officially opened Thursday 5th September by members of Mayo County Council, An Taisce, An Garda Síochána and pupils from local Schools. This crossing has black and white stripes (like a zebra) with orange flashing beacons at each end. A Zebra crossing gives the pedestrian right of way once their foot is on the crossing. However pedestrians must make sure that all the traffic has stopped before crossing and they should keep looking and listening as they cross. Garda Superintendent Joe Doherty “Pedestrians and motorists are equally responsible for pedestrian safety .Pedestrians can’t do much to improve a driver’s habits, just like drivers can’t do anything about pedestrian behaviours. We all must take responsibility to follow the law, pay attention and share the road”. Use the following places to cross the road safely. This is marked by yellow flashing beacons. The actual crossing area is marked by black and white ‘zebra’ stripes. Drivers must stop to let you cross. 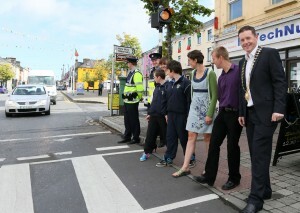 As they approach the crossing, they should slow and be prepared to stop. They must stop behind the stop line if there is one and must not enter any part of the crossing. Drivers must not overtake or park within areas covered by zig-zag markings on either side of the crossing. You do not have the right-of-way over other traffic until you actually step onto the crossing. Never step onto the crossing if this would cause a driver to brake or swerve suddenly. You must not cross within the area marked by zig-zag white lines if these are provided on either side of a zebra crossing. If they are not provided, you must not cross within 15 metres of the crossing. If there is a central island, treat each side as a separate crossing. Always watch carefully for approaching traffic. Place one foot on the crossing to indicate that you wish to cross. Wait until traffic has stopped before you start crossing.